6.55 points at 20 votes (rank 487). Gamebase64 6 28th October 1998 - "Average"
You either play alone with Mario or in twos with Luigi, Mario's brother, joining in. In the game, you need to knock over all enemies by jumping against the platform on which they move from below and then collect them. In the first level these are turtles, later crabs and ghosts follow. If you do not collect the knocked over turtles in the first level fast enough, they turn around again and get faster. Then also the colour of their shell changes from green to blue and after a short time to red. For each collected enemy you can also try to collect coins. Below there is also the POW switch. By jumping against it with the head you can knock over all enemies at once. But keep in mind that you can only use it three times. 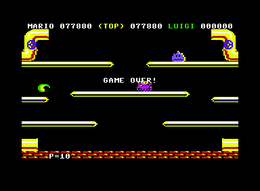 After the second level, there is a bonus level in which you have to collect coins within a limited time span. All levels have the same level design. Only the graphics of the platforms change. 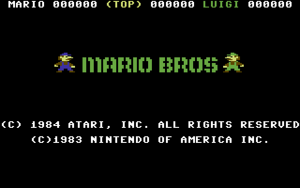 At the top the scores of Mario and Luigi are shown. In between you see the current top score. The small heads below the scores show the lives that are still left. At the far bottom the current level is shown. There are simple sound effects and short melodies. Many animated sprites bring movement into the game. When having reached 20.000 points there is a non-recurring extra life. After finishing the 25th level you get into the so-called KO mode. Here you play until the game is over. Higher combination points (800-1600-2400-3200-4000) are possible, if several knocked over enemies are collected shortly after each other. At the start of a level the middle platform should be taken. A knocked over enemy should be collected straight away, because it will turn over again! For each collected enemy, a coin comes out of the upper yellow pipe. Touch the coin before it reaches the lower yellow pipe. The green wind always appears at the player's height. The last enemy changes its colour and raises its speed! Sledgie: "A remake of the arcade classic relatively well done. 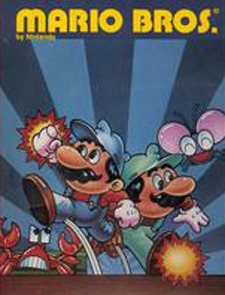 Another clone was released by Ocean Software in 1987. I think the conversion by Atari is all in all better, although the sound does not quite carry over. The 2-player mode is much fun. But as I am not really a fan of Mario games, I have given the game a medium vote of 5 points." Guybrush: "As Giana fan and hater of Mario, this is no game for me, I abstain from voting." Werner: "I also like the Atari version better than the Ocean version. The game comes really rather close to the original concerning graphics and gameplay. They passed on the fast red wind, the falling icicles and the longer sliding phases on ice platforms. By this, the difficulty grade does not rise any more in the further course of the game. 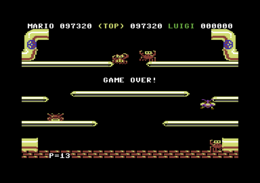 6,5 points"
When the arcade machine Donkey Kong (1981) was released, Mario still had the profession of a carpenter, in this game he appeared for the first time as a plumber.